What Is the AppExchange Partner Program? What Is the Partner Community? Define what the AppExchange Partner Program is. Define what the Partner Community is. Sign up for an AppExchange Partner Program account. Invite team members to your AppExchange partnership. List the different ways you can get questions answered. If you use Salesforce, you know that almost everything can be customized to suit your needs. From basic UI tweaks to advanced under-the-hood changes, the Salesforce platform is built to adapt to your business challenges. But did you know you can share these customizations with Salesforce users and build a thriving business at the same time? That’s where the AppExchange Partner Program comes in. The AppExchange Partner Program gives you everything you need—including knowledge, tools, and infrastructure—to take your ideas to market. As an AppExchange partner, you build on the Salesforce platform, which puts you ahead of the game even before your team starts developing. You don’t have to be a veteran Salesforce user to become an AppExchange partner. All you need is an idea for the next killer solution—we’ll help you bridge the gap between idea and marketplace. 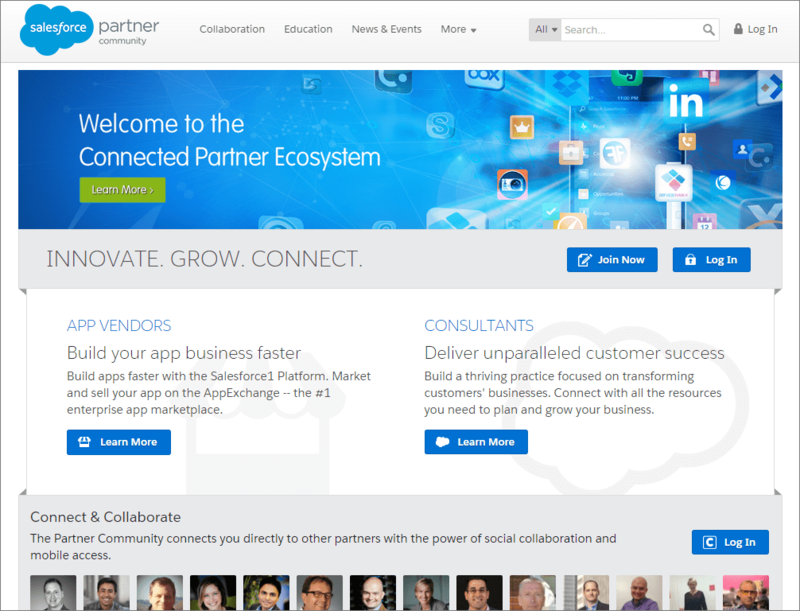 The Partner Community is the online home of the AppExchange Partner Program. Foremost, it’s a meeting place—a community where AppExchange partners and Salesforce experts gather to share knowledge. It’s also a resource—a place where you can go to get training, support, and manage your AppExchange partnership. Here are some of the things you can do in the Partner Community. Learn how to plan, design, build, sell, and distribute your solution. A lot goes into taking an idea to marketplace. And the Partner Community has a wealth of resources, like instructional videos and in-depth documentation, to guide you on that journey. If you’re looking to expand your Salesforce expertise, we also have an extensive online training catalog. The catalog includes certification prep courses, role-specific training for your team, and even information about the new Lightning Experience. Collaborate with other AppExchange partners who are building on the Salesforce platform. When we say community, we mean it. The Partner Community lets you meet and learn from AppExchange partners who’ve built successful businesses on the Salesforce platform. As you gain experience, you’ll have the opportunity to share your knowledge with others. Engage with Salesforce experts. In the AppExchange Partner Program, you’re never on your own. Each week we host office hours in the Partner Community, which give you a chance to engage directly with our experts in sales, marketing, and security. It’s also where you can open cases and communicate directly with our dedicated Partner Support team. Discover new features, products, and programs. We’re always looking for ways to make partners more successful. The Partner Community is how we share these developments and show you how to integrate them into your business. Take your first step in joining the AppExchange Partner Program. It's easy and free. Simply follow the AppExchange sign-up instructions. As you develop, sell, and support your solutions, you’re likely to work with one or more team members along the way. After you’ve been accepted into the AppExchange Partner Program, it’s easy to invite a colleague to join you. Log in to the Partner Community using the credentials associated with your partner account. Enter the email address of the person you’re inviting. Optionally, assign permissions to fit that person’s role on your team. Click Invite. We’ll send an email to that person inviting them to log in to the Partner Community. That’s it! Repeat this process until you’ve invited all your team to the Partner Community. If you ever want to change permission settings, you can do so on the Manage Users page. Delivering regular innovation is part of the Salesforce DNA, so we’re constantly looking for new ways to help AppExchange partners build a thriving business. To help you stay current, we offer several channels for you to learn about the latest technology, resources, and events. Some of these resources require you to log in to the Partner Community first. Before you try to access them, make sure that you’ve signed up for and have been accepted into the AppExchange Partner Program. No muss, no fussYou want a one-stop shop for information about the AppExchange Partner Program. The News & Events page in the Partner CommunityThe News & Events page gives you quick access to recent articles and blog posts, as well as a calendar of events and webinars. And don’t worry if you can’t make a webinar—most are recorded. A Chatter enthusiastYou want to engage in conversations or ask questions. The Announcements and Alerts Chatter groups in the Partner CommunityWe share general AppExchange partner news, tips, and best practices in the Announcements group. The Alerts group is where we communicate important and time-sensitive information. A social media guruYou want information that’s easy to share with your personal and professional network. All about the visualsYou want information delivered with compelling audio and visual content. What are the requirements and benefits for AppExchange partners? For up-to-date information about partner tiers and the requirements, see the AppExchange Partner Program Page. As you develop, sell, and support a solution, it’s normal to run into questions that you can’t answer on your own. Along with keeping you in the know about news and events, the Partner Community is your best resource for getting those tough questions answered. Every week we host AppExchange partner office hours. Office hours give you the opportunity to learn from and chat with Salesforce experts about topics like technology and marketing. And yes, they’re way better than the office hours you remember from school. You can check out the office hours schedule at p.force.com/officehours on the Events Information tab. We have two Chatter groups dedicated to questions from AppExchange partners. Experts on the partner operations team and fellow AppExchange partners monitor these Chatter groups. Have a general question about the AppExchange Partner Program? Ask in this group. Have a technical question about the tools, technologies, and techniques you use to build your solution? Ask in this group. You can also share AppExchange partner best practices, including technical how-tos, workarounds, and design patterns. Update your Chatter settings so that you receive an email whenever someone posts to these groups. It’s a great way to learn about the technical and business aspects of an AppExchange partnership. And the groups contain valuable info that's guaranteed to save you time when you begin developing. To update your Chatter settings, go to the Collaboration tab in the Partner community. Also consider getting notifications for the Official: AppExchange Partner Program chatter group, where we make announcements and provide updates. If you’re having trouble answering a question using other Partner Community resources, contact the Partner Support team. They can assist you with questions about your application to the AppExchange Partner Program, partner status, and order status. They can also help you enable the AppExchange-specific features that you’ll use to run your business. To log a case with Partner Support, navigate to the Support page in the Partner Community (1) and then click New Case(2). If you need help from Partner Support, make sure that you’re logging your case in the Partner Community and not in a Salesforce org. If you log a case using the Help & Training link in your org, the case is routed to the wrong team.